We’d all like to think that we’re exempt from getting older, but the truth is that time catches up to all of us. Whether you like it or not, you may have noticed that it may not be as easy to read the restaurant menu or the words in the Sunday crossword puzzle as it used to be. As we age, slight to moderate vision loss can often be expected. When people realize that they can still see most things perfectly fine, they assume this vision loss isn’t serious enough to warrant a trip to their local Fresno optometrist. Even if your vision problems are only noticeable when you try to read something up close, it’s important not to ignore them. You might think that you’ll just pick up a pair of those cheap reading glasses you’ve seen in the pharmacy section of your local Fresno grocery store, but wait! Wearing those glasses instead of visiting your optometrist can actually do more harm than good. Here are a few reasons why. At our Fresno optometrist office, we utilize multiple data-driven tests to fully analyze your vision. When combined together, this gives us a very exact prescription for correcting the sight in both of your eyes. When you choose reading glasses at the grocery store, however, you’re relying on the “Hmm, that looks pretty good,” self-diagnosis. Sadly, wearing glasses with the wrong prescription can result in symptoms like headache and additional eyestrain. Another thing many people don’t realize is that eyes almost never have the exact same vision capabilities. An optometrist is able to create glasses in which each lens is perfectly customized to the vision in the eye it’s meant to serve. Unfortunately, the reading glasses you find in a Fresno grocery store will have the exact same lenses for both eyes. Do you like to browse the internet or do a little online shopping? Perhaps you thought that some cheap reading glasses would be all you need to bring the computer screen into focus. Unfortunately, these mass-produced glasses aren’t created for computer use at all and can actually make the words on the screen even harder to read. 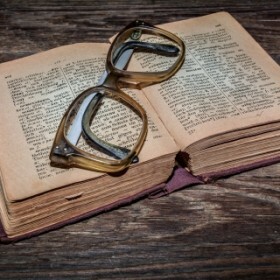 Why put your eyes and vision at further risk by wearing cheap reading glasses? Book an appointment at our Fresno optometrist office today, and we’ll make sure you get a customized solution that will benefit your vision.